The webpage of the Archæological and Ecological site of Rumipamba, under the administration of the FONSAL. Webpage of the museum, with a brief presentation of the collection and life of Jacinto Jijón y Caamaño. The website of the Bahía de Caráquez museum, with colorfull presentation of its archæological artifacts section and cultural activities. 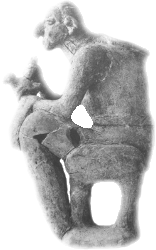 The website of the Archæeological and "Lojanidad" museum of the University of Loja. The webpage of the Weilbauer museum of the Catholic University of Ecuador. The website of the cultural centre of the Abya-Yala editions, in Quito. The webpage of the National Museum of the Casa de la Cultura Ecuatoriana "Benjamín Carrión". Website of the MAAC Museum of Guayaquil. Ethnographical Museum Of The Mitad Del Mundo. The website of the Sinchi Sacha foundation, owner of the Mindalae museum. To read the informations about the museum, clic on "Museo Mindilae". The museum of the National Bank of Ecuador, in Quito. Interactive presentation of the ruins discovered in Tulipe, based on the excavations of the FONSAL. Museum about quotidian life in the XVIth century in Quito and Ecuador. The museum and the site of Pumapungo present artifacts of Kañaris and Incas cultures, melt along centuries and who have left path of their identities in the actual area of Cuenca and suburbs. Website of the Capilla del Hombre Guayasamin Foundation. Archæological complex with the exhibition of the fusion of three cultures: cañari, inca and spanish in the Cuenca city. 25	 Museum "Lovers de Sumpa"
The Museum "Sumpa Lovers" was created by the Central Bank of Ecuador to spread the lifestyle of the ancient inhabitants of a region that spans the Santa Elena Peninsula. Archaeological studies reveal the history of ancient Ecuador and the development of a territory that was known in legend as Sumpa, which ancient heritage, combined with the European presence gave way to the communities of today.